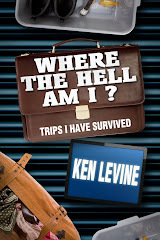 By Ken Levine: My big announcement of the year! 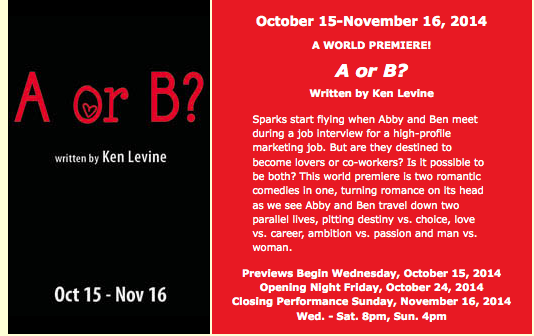 I'm thrilled to announce that my new play, A OR B? will be part of the 2014-2015 subscription series of the Falcon Theatre in Burbank. 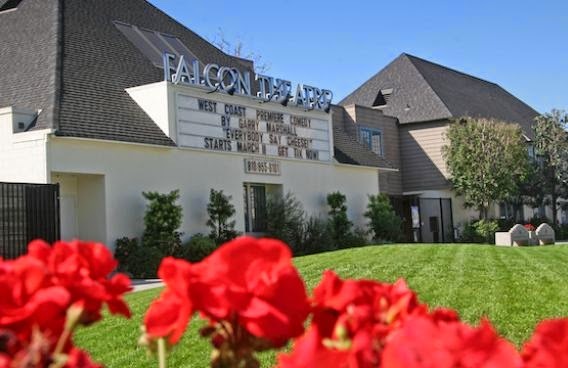 Owned by Garry Marshall, this is one of the nicest and most respected theatres in Southern California. The whole season looks great actually. I have to say, this is a big step up for me as a playwright. My first production was in a war zone in LA on the second floor above a pizza parlor. My friends wanted to see it but all turned back at La Brea. My second production was over a bowling alley (I kid you not). Nothing is more ideal for comedy than crashing pins all night. Plus, there was a Jerry's Deli attached. Going to the war zone production was far safer than a post-theatre snack at Jerry's. As the ad says, A OR B? is a romantic comedy exploring both personal and professional relationships from many angles. If I did my job right, it's both funny and a heartbreaking -- y'know, like love REALLY is. For ticket information and more details, here's where you go. And to be put on the Falcon email list, where you get all kinds of great scoops, you sign up here. We start rehearsals in the fall and I'll keep you up to date on the process and progress. But most of all, I'd love for you to come see the play. Who knows? Someday I may be at the Tony's and some snarky blogger will take gratuitous shots at me. The theater is about dreaming. Congrats. We will all expect free tickets. Ken: the top comment from "abdul ameer" is spam. You may want to remove it. 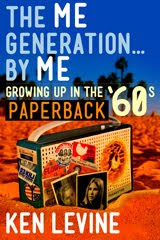 I am so glad you didn't go with your first idea for the title: Paper or Plastic? Congratulations! I look forward to seeing it! Congratulations. Well done and hard earned. Ken, I'm sure you have considered the myriad possibilities for sequels: "C or D," "E or F," "G or H..." Not to overlook the all-inclusive and ever-popular, "A to Z." This is such great news, and so well deserved, Ken. I'll be there with bells off. Bells are a lot more distracting than bowling pins. Bonnie and I are so proud of you. Great news, and the play clearly covers themes that are of great interest to you. Enjoy! 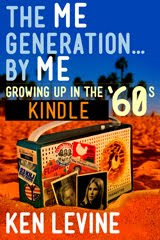 Congratulations Ken- I might have to visit a friend in LA sometime during that month. If I can't though, I hope you take it's success on the road and move it closer to where I live. Love the theme. Congratulations, and this creates a FRIDAY QUESTION: Your new play "A OR B?" is by you and not the longstanding team of Levine & Isaacs. In a successful partnership, how do you know when to "go it alone" and when to take a project on as a team? I hope your play makes it big so I'll be able to see it without having to travel to the West Coast. The synopsis is intriguing, as one would expect. Awesome. Looks like there's a road trip to So. Cal. this fall. Looking at their lineup, I might have to subscribe. Besides your show, the Carlin Home Companion could be interesting. Decades ago, the first screenplays I read were actually the Samuel French copies of plays that were made into movies: The Lion In Winter, A Man For All Seasons, and Play It Again, Sam. Any chance we'll get to read A OR B? sometime? Congratulations, Ken. Especially since Garry Marshall was one of your first writing influences. Congratulations, and break a leg! 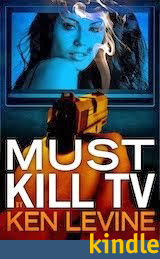 Wish I could see it, but maybe some theater will do a Dallas production. We have a lot of excellent companies here looking for new material. But you do realize that if you want to win a Tony, you're going to have to marry David Isaacs. Fabulous. I will definitely be there to see it. It is a very nice theater. I saw my friend Jane Morris in Arsenic And Old Lace there some 15 years ago. Joan Darling was also in that production, and Richard Kline did the Peter Lorre role, so they get good actors. So where IS the nearest deli? Break a leg......looks good on 'ya! Congratulations, Ken! I'm looking forward to it. So...you've been secretly writing behind our backs, eh? Congratulations, Ken! This is very exciting. I'm sure you have actors in mind. Will you be involved in the casting process? I don't live in LA. :-( Otherwise I'd definitely go and see it. Are you directing it too? Mazel Tov! It's amazing that you have your hand in so many pots and you still have time to blog every day! I had the pleasure of reading your play, A or B?, when I had an audition for the role of "Abby". I loved it! How fun it would be to explore all those scenarios in rehearsal and in performance! Alas, I have not heard about a callback. :( Darn. Maybe callbacks haven't happened yet. Anyway - I still love the play and look forward to seeing it if not playing in it. I wish you much success with this run and with the play's future!